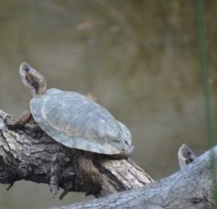 These freshwater turtles have dark brown to olive colored bodies and shells with a carapace of 5 to 8 inches in length. They are amphibious living in and around freshwater bodies. They are usually seen basking together in the sun. Although they are comfortable in deep water, they build terrestrial nests. Females lay half to a dozen eggs once or twice a year. Conservation: these freshwater turtles are native to California. Their free-ranging numbers are depleting due to competition from invasive species such as the red-eared sliders. Distributional range in the U.S.